Until a few months ago my mental image of Sleaford was shaped by crawling through the town centre on the A15 to Lincoln – so, an outdated picture as a bypass opened in 1993. Circumstances mean that I’m now getting a relaxed view of the town and becoming aware that it has more about it than the scene of traffic through the car window allowed. There’s the medieval church of St Denys (apparently a composite saint), the 18th century Sleaford Navigation and the National Centre for Craft & Design, to name just three things worth exploring. 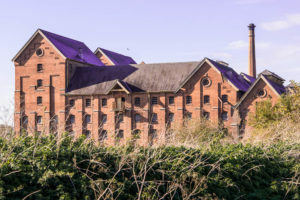 The introduction of more efficient malting techniques at Bass’s other plant led to the closure of the maltings in 1959, since when they have had a sad and confused history, the home for failed uses and the subject of unrealised (unrealisable?) 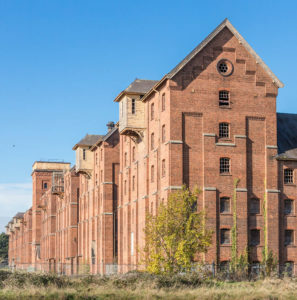 ambitions – a fire in 1976 caused severe damage to three of the malt houses. 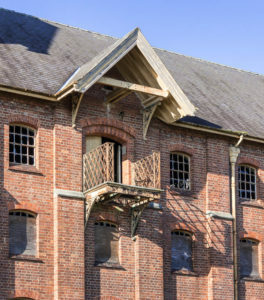 Elsewhere, somewhere more prosperous, apartments, cafes, bars, galleries, offices and workshops would ensure the building’s future and bring it back to life. For now, pigeons are the beneficiaries of its dereliction.